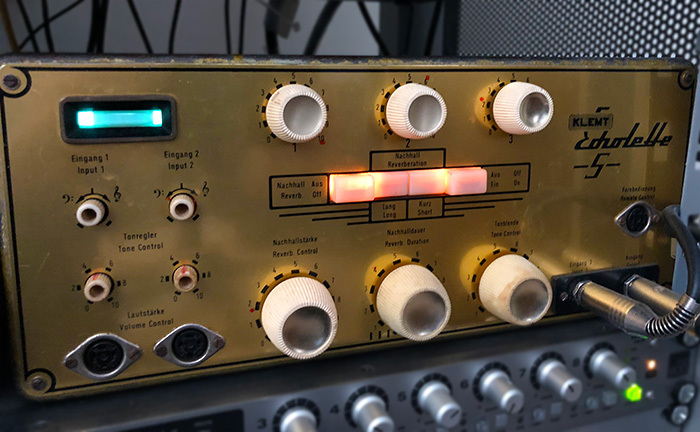 The Dramastic Audio Obsidian is a VCA stereo compressor based on the famous Solid State Logic bus compressor that provides that familiar ‘glue’ (and punch) that has helped tracks sound cohesive and ‘like a record’ for years. The Obsidian makes some significant sonic and character improvements to the original design by including four custom TXIO transformers made by Jensen just for Dramastic Audio, and with VCA’s from THAT Corp, Gold Plated Neutrik connectors, gold-plated custom switches from ELMA and a pretty massive power supply this is one high-end piece of kit…and it sounds it! 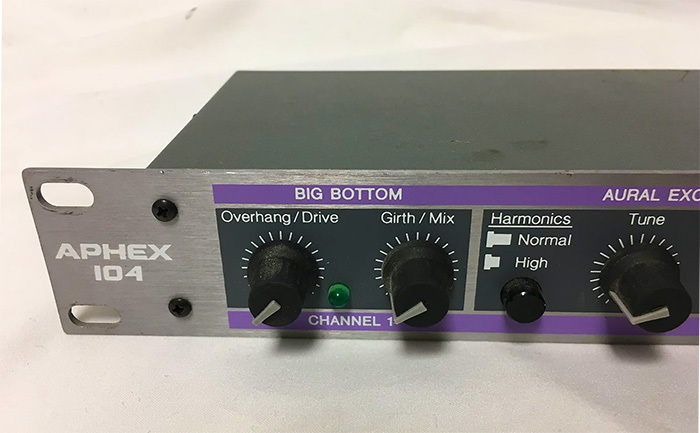 Being in the fortunate position to audition many hardware boxes I auditioned every manufacturer of this type of compression, and while there are some outstanding designs, the Obsidian still won, for me, on every style of music I put through it. It's capable of making a mix sound tight and focused immediately with the HPF in action all the time. I do sometimes find myself running tracks through it such as vocals, bass or drums, and blend to taste before strapping it back over the mix bus. 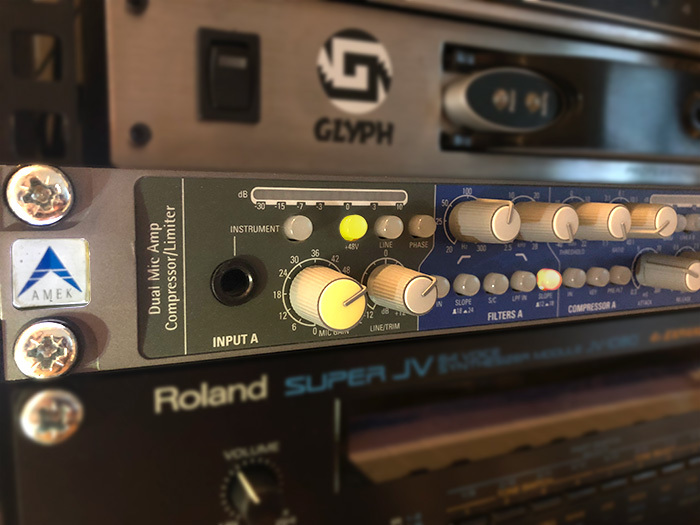 This is one compressor that I have never EVER regretted purchasing and one that (in my opinion) blows away every other hardware 'SSL style' bus compressor, and software emulation, by miles. Always one to cause a smirk when tweaking the “Overhang” or “Girth” controls, this is a cheap sleeper tool that I like to use strapped across backing vocals. It kicks in some unique harmonic character and is easier to use in a creative way than the plug-in emulations. Capable of adding bright, pushed, grab and focus, I tend to run this in parallel or behind a track, tuning the frequencies from 800Hz to 6kHz to taste. I don’t use the Big Bottom section as much as I used to, but it’s useful if a track is a bit lifeless or needs some extra weight. Used sparingly, the Aphex 104 is still a handy tool to have in my arsenal, and no plug-in quite does what this does. I bought this box back in 2004 while looking for a stereo preamp for recording acoustic guitar. My favourite mic pre remains the Neve 1073 (no surprises there), but I wanted something faster and less coloured for these tracks. Even as I was handing over the moolah, I was suppressing a quiet yawn – expecting this to be a politely efficient, but ultimately uninspiring processor that was destined for eBay once the project was over. But I’ve kept hold of it, and over the years it’s become the preamp I use more than any other (even the 1073!). 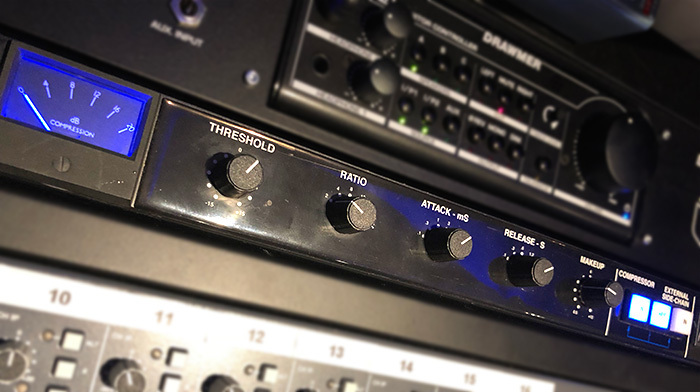 The DMCL (Dual Mic Amp Compressor/Limiter) was the last in Amek’s Pure Path range of outboard, designed by Rupert Neve and based on his designs for the iconic Amek 9098i mixing console. The preamp uses Neve’s TLA (Transformer-Like Amplifier) circuit with a healthy 72dB gain. After which the signal passes through a useful HP/LP filter stage to focus the audio before hitting the compressor, equipped with Neve’s “And Much More” (&MM). This changes the response from hard to soft knee and I keep it permanently engaged as it’s pretty much the only control that seems to introduce any colour at all into the audio. It’s clean, super-low noise, beautifully detailed and neutral without being sterile, and it is exactly these qualities that make recordings through it an excellent base for applying plug-ins while mixing. Doggedly reliable rather than exciting, this "Volvo of the preamp world" always produces highly usable results. And if I want more mojo, well… that’s what the 1073 is for. I collect guitar pedals the same way my son collects Lego Star Wars mini-figures – a habit that has no prospect of being satisfied and will lead me to penury some day. 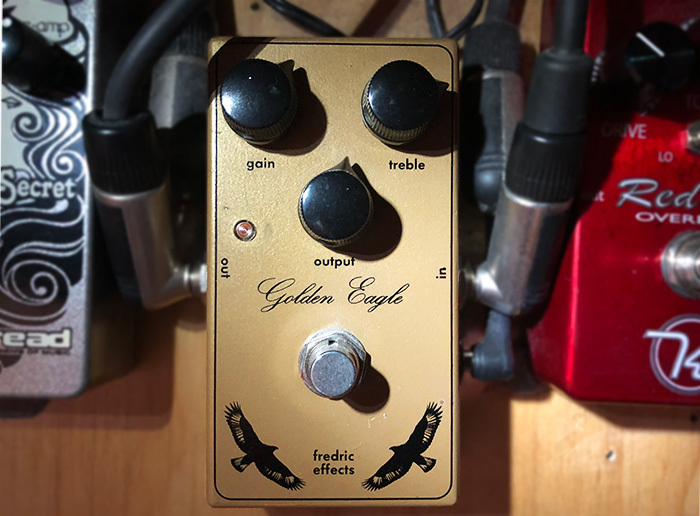 In truth, I could have chosen any number of pedals for this write-up, but I’m particularly fond of the Golden Eagle as it represents the culmination of a Homer-esque odyssey hunting out clones of the mighty Klon Centaur. If that means nothing to you, then move on now… but if you’re at all interested in guitar pedals then you’ll know there is probably more written about this one overdrive than any other. With originals going for around £2000 (crazy money for a small box of solid state electronics – even if it does contain the fabled “magic diode”), there is a huge market in affordable klones trying to replicate the thick, smooth and transparent overdrive tones of these pedals. I’ve tried a few… OK, I’ve tried a LOT… of klones, and I’m happy to leave it here. The sound is spot on and the smaller “MXR” format means it doesn’t take up acres of real estate on my pedal board. At £125, it's a lot more wallet-friendly than shelling out for an original Klon and by happy coincidence it’s also made in North London, so nice to support a local maker! What’s so special about it? The sound! It is extremely transparent like the Maselec MEA-2 and GML 9500 EQ with just a hint of musicality that simply brings a smile to your face. Despite my reputation for heavily distorted music, my favourite effects are delays, more specifically tape delays. Everybody knows the Roland Space Echo’s, the Echoplex and WEM, which are fantastic, but there is one little-known unit that really stands out and that is the Klemt Echolette NG51. Originally built in the late 50’s this delay was used by the Beatles during their Hamburg days. This tube tape-delay may not offer the same flexibility as the more popular choices but what it has is an incredible character. It has three modes, Fast, Slow, Fast + Slow and it’s enough to get your source just blend in the track. It’s noisy and dirty by modern standards, but the tone it provides is just incredible. It is my go-to delay for vocals. 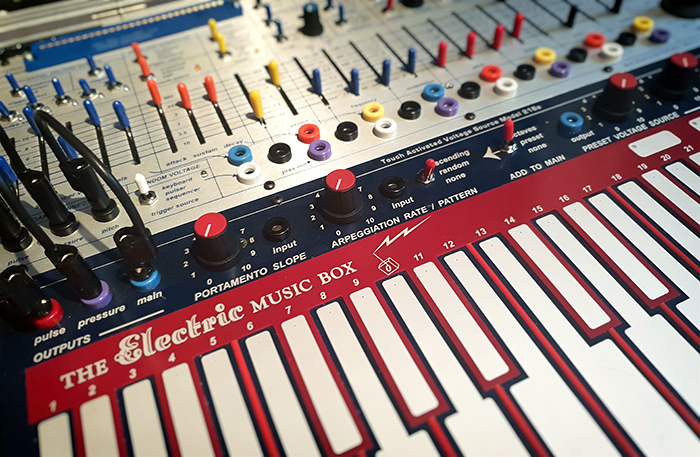 The Buchla Music Easel (as anyone who has ever spoken to me about synths will attest) is probably my most favourite musical object. It’s the finest example of instrument design I’ve ever comes across, with a perfect blend of deep sonic versatility and workflow that’s seldom achieved in other instruments of this ilk. Its unique ability to craft interesting rhythms, textures and drones is matched by its superb layout, which reveals a vast array of performance-friendly controls and capabilities – something hard to match with even the most comprehensive modular system. 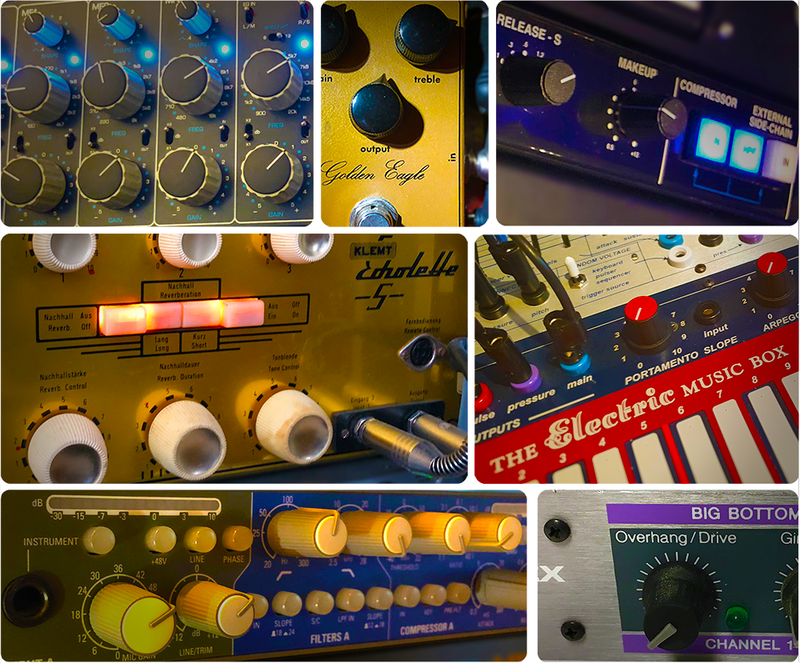 The Music Easel is great for reactive and experimental musicians like me, who like to delve deeply into the possibilities of a machine in the search for that perfect tone. I always find myself uncovering new things and I am yet to reach the limits of what the Easel can achieve. Based around two oscillators, two low pass gates, a single envelope generator and a simple 5-step sequencer, you’d be forgiven for thinking that it’s not particularly flexible, but it is the synth’s simplicity, the implementation and choice of the circuits which makes it unlike anything else. The Music Easel’s unique layout is intuitive and inviting (something Don doesn’t get enough praise for I might add!) meaning you’re never without inspiration or options for discovering a new sound. The 218-touch keyboard is just the icing on a very delicious cake - its pressure control, preset voltages and MIDI conversion complete the playing experience. One of my most favourite modules in my Eurorack system is the humble attenuator. Yes, that simple little device that can yield so much potential when properly implemented in a well thought out system! My module of choice? The Dreadbox White Line - a 2 channel 2HP passive attenuator that provides a single input and output with a micro shaft knob in between each channel, which lets you control the amount of input signal reaching its destination. I use it for modulating the pitch of VCO 2 by the amount of voltage being produced at VCO 1, and since they both share the same CV pitch information, they track perfectly for very clean, crisp FM with a wide range of useable timbres throughout the control knob’s range. Attenuators have a vast array of possible applications. 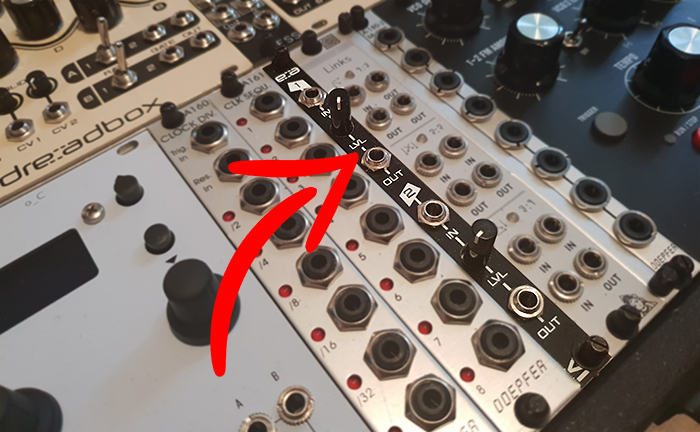 Use them to control the depth of an LFO, envelope or use them to add voltages to another source - they are incredibly versatile and often overlooked. Sure, you can never have too many VCA’s - but remember you need something to control their results!